To read another recent poem of mine about gratitude as well as essays and poems by several wise, inspiring women, visit Buddha Chick Life a bimonthly online magazine where women gather to share insights with hearts and minds wide open. i'm right with you, sister... i love these words. Treasure words, emotionally powerful spirit words, I am blessed. Remembering you and your family. What wisdom nature brings right to the door! You are an incredibly talented and gifted writer, Laura! This is really beautiful! Beautiful! This is full of deep feelings and gratitude. 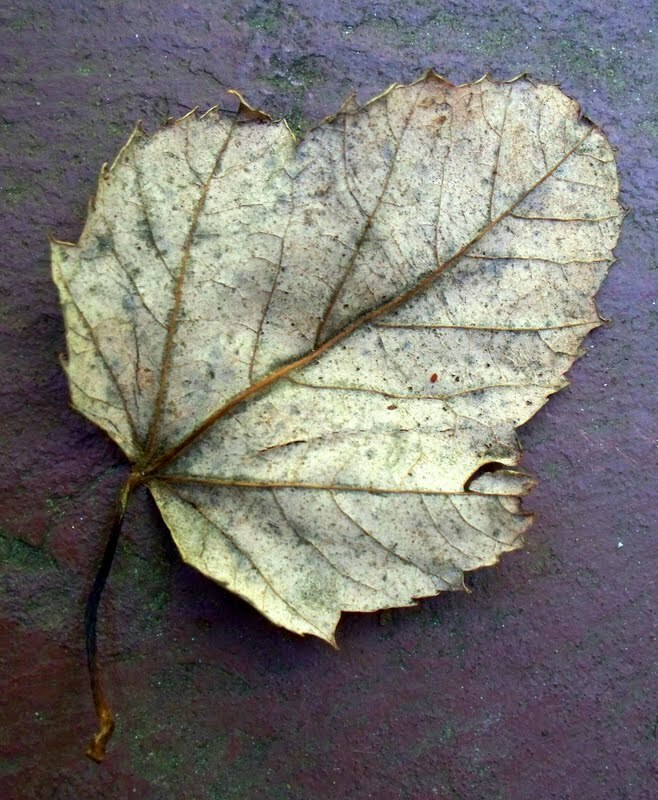 So much a leaf can tell our hearts. I always enjoy your words and your point of view so much--this leaf that lends strength where it itself has none is just one example of how you always make us reflect on how important it is to pay attention to the things that matter instead of the things that don't. Thank you. Beautiful, emotionally charged words (as they should be!) and a lovely form mimicing the leaf. So beautiful, aesthetically and emotionally and poetically. There'll be a million of these leaves blowing around soon! So uplifting - the words and the photo. A reminder of what is important. Thank you. Such life your little leaf has. We are all so individual. Ageless wisdom lies, often wrapped in the smallest, simplest packages...a leaf is sometimes all we need to remind us, and to teach us of life. Sensitive and splendid work. Laura, whenever I visit, I feel as though I am drinking up your energy, recharging myself for my next real world battle. I'm not sure if you realize just how far your reach travels, or just how many souls have been lightened at your hand...but you are doing good work here, and I wish to express my gratitude to you...thank you! The words are awesome, 'specially when packed inside that form! Great job! Ah,. sweet fragility, Laura. Such beauty all for our pleasure. The words seized my heart and shook it with a friendly hug. A picturesque, well framed, well said piece that point out that in the tiniest bits of nature, we find symbols that encompass the whole. Thank you, G.
The shape of your poem, thoughts, and heart all like a leaf reminding us to stop and pay homage to the journey. mirroring and attention are two vital functions of humans, thank you for this back to center poem, lovely. Beautiful words and photo, Laura. Have a great weekend! Such beauty, nature's gifts, words to match. AB-SO-LUTE-LY WONDERFUL. A standing ovation for this beautifully written life wisdom. The language arts teacher in me loves your concrete poem:) And the poet in me loves the beautifully written message. Love your pics, and your poetic way of approaching things, Laura! I love your poem and your photos are just gorgeous. You do have a lovely way with the words. I wish you a wonderful weekend! Again, the combination of words and photos makes this post amazing!